Is an 84-Month Auto Loan a Good Idea? You will never get perfection in any category, but it’s important to know exactly what tinkering with getting a good deal in one category will mean for the other categories. For this experiment sake, let’s say you want to take out a $10,000 auto loan, and you are deciding whether the loan should be 1,2,3,4,5,6, or 7 years long (12, 24, 36, 48, 60, 72, or 84 months, respectively). Let’s assume that the interest rate you are offered on all of the loans is 5 percent annually. First, let’s consider the biggest “wallet shock” of any loan: the monthly payment. While far from the most important consideration of any loan, it is critical that you will be able to afford this payment each month without straining your budget or dipping into savings. If you are looking to minimize your monthly payment, the 84-month plan is a winner. What’s not to love about a monthly payment that is half the size of a 36-month loan? But you probably also notice that there is not a huge difference between the payment you will be making once the number of years increases: what is the big difference, you will wonder, between a 60, 72, and 84-month loan? The answer, my friends, is interest-ing. The reason banks, car dealerships, and other financial institutions are willing to lend you money is because they make money off of you doing so. The longer you stretch out the length of your loan, the longer you will be paying someone else to be able to do so – and the more you will end up paying total. While an 84-month loan might seem like a great deal if you are looking at the monthly payment, it’s not long term. Is it worth it to you to pay an extra $550 to stretch the duration of your loan from 5 years to 7? Maybe, if money is tight month-to-month. But maybe you will reconsider when you see what percentage of the money you would be spending would be going towards lining your lender’s pocket instead of paying for your car. If you choose the 7-year loan, a full 15 percent of the amount you pay will be going towards not your car, but straight to the bank. So, when does it make sense to get an 84-month auto loan, and when does it not? If you are cash-strapped. 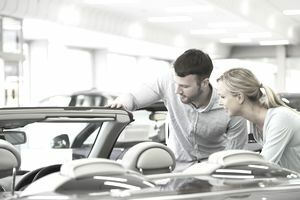 Although I would advise you to consider taking the bus or other public transit if it is going to take you 8 years to pay off a depreciating asset that’s unlikely to last for a very long time, if you really need a vehicle and really can only afford the lowest possible monthly payment, take the loan. Sorry, the above answer is the only good reason to go with an extended loan. And if your financial circumstances improve, you should try and pay the loan off earlier (assuming that there are no penalties for doing so). If you can afford a higher monthly payment. Really – why would you prolong the agony of owing someone else money? If you can comfortably afford a higher monthly payment, it does not make financial sense to drag it out. You will end up paying less over the long run, and you will have peace of mind that comes with owning something outright much more quickly. If you have alternative financing available, or can you borrow cash from a relative to buy a vehicle? If so, you should highly consider doing so to save yourself unnecessary interest payments. Make the biggest possible downpayment that you can, and try to pay off the remaining balance as quickly as possible. If you do not need a vehicle, if you live in a major metropolitan area with reliable public transportation, or if you can easily carpool with a neighbor, you need to ask yourself whether or not paying thousands of dollars in interest is worth it—not to mention the high cost of maintaining, fueling, and a vehicle.